Give me your tired, your weary, and weak and let me make them laugh. Rodney (not Dangerfield) Browne who unlike Dangerfield, has received a lot of respect is coming came to Madison Square Garden. Advertised as 6 straight weeks at Madison Square Garden the Evangelist who has the anointing to make people laugh, be struck dumb and frozen has been directed by God to reap in the harvest next year. This direction has come via a dream. "I had a dream in which Billy Graham was talking to me about his crusade in New York in 1957. A crusade that lasted 31/2 months, 2,000,000 people came through the doors of Madison Square Garden, and 55,000 people were saved. As I listened to Billy Graham speak in my dream, my heart just broke for New York city, I started weeping I wept so hard that when when I woke up, my pillow was soaked with tears. As I got out of bed, I knew we have to go to New York and launch one of the biggest soul winning crusades since 1957. It just dropped in my spirit and I knew it by the Holy Ghost." Rodney not on the phone or in person but in a dream. I wonder If Mr.Graham knows that he has communicated to him ? If it was not Mr. Graham then who was it.Think about it ! There is no scriptural verification given or even sought . This proves Rodney does not test the Spirit but believes everything is from God because it dropped in his spirit. This anti discernment is the modus operandi of his ministry. Rodneys attempt to affiliate with Mr. Graham is futile. Brownes gospel is experiences based on unbiblical manifestations not on repentance and picking up ones cross to follow Jesus. people to be one of the 150,000 prayer partners, which is one for each soul. What does this mean? Is this another scam just like Larry Lea's 300,000 people spiritual warfare prayer army which donated $100 to join? (which turned out to be 30 million collected). Time will tell. But what is the connection of one person per soul. Besides this having no substantiation biblically. He states in his prophecy from this dream 150,000 are to be saved; Does this mean anyone who giggles has been hit by the anointing. If you can make sense out of this please let me know. Well one always hopes for the best but even the best intentions can't bring results. Despite their own PR campaign it just didn't produce what his laughter did just a few years before. Good News America Is A Flop! No Signs or Wonders! The Tampa Tribune reported that South African Evangelist's Rodney Howard Browne New York Crusade is a flop. Rodney taught pastors that "sheep needed to be fleeced or they would have too much hair and could not see where they are going. It was the pastors job to fleece the sheep." NEW YORK - You know what they say about New York: If you can make it here, you can make it anywhere. That said, Tampa evangelist Rodney Howard-Browne, in the final days of his multimillion-dollar, six week crusade in Madison Square Garden, is scaling down his plans for next summer. "We're going to Shreveport,'' he says. The mainly black and Hispanic crowds average about 3,000 a night in the famed 19,000 seat arena. Even though the free meetings include entertainment, Howard-Browne's "Good News New York'' campaign has failed to attract the size audience he wanted. They didn't even come for Carman, the popular Christian singer from neighboring New Jersey who drew more than 25,000 fans to a 1996 concert at Tropicana Field in St. Petersburg. Only 5,600 showed up for his 40 minute music set Saturday. "New York's a hard place, even when you have support,'' says the Rev. David Epstein, pastor of Calvary Baptist Church in Manhattan. 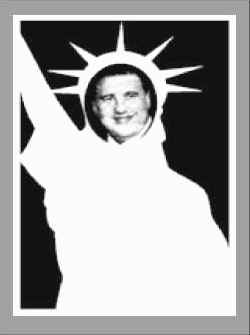 Howard-Browne's goal was to "shake the Big Apple to its core'' by sharing the good news of the Gospel of Jesus Christ. But he's had many obstacles along the way: a blistering heat wave, New York's obsession with the sudden death of John F. Kennedy Jr. and Howard-Browne's association with the controversial "holy laughter'' movement. That movement is how Howard-Browne, known as the "Holy Ghost bartender,'' made his reputation. At services in the Tampa area and around the world, followers are overcome with the Holy Spirit and laugh uncontrollably. Howard-Browne stuck to his promise to keep the crusade strictly evangelical. However, that may have contributed to the low attendance. "Rodney Howard-Browne coming into the Garden without holy laughter is like David Copperfield putting on a show without magic tricks,'' said one New York writer. On the first Friday night of the crusade (which ran from Wednesday through Saturday for 6 consecutive weeks) around 2,000 people occupied the 20,000 seat arena. This proves Rodneys dream was just that only a dream. but what do you expect when he imagined Billy Graham speaking to him in it. "It just dropped in my spirit and I knew it by the Holy Ghost" Was more like it just flat dropped. There was no biggest soul winning crusade since Graham's 1957. No 2,000,000 people came through the doors of Madison Sqaure Garden, and 55,000 people were saved. Not at all, it was barely 2,000. considering the fall away rate in these crusades he may have lost more than came through the doors! Looks like no one is laughing now, at least not with him. What can I say, N.Y. is a hard town to play for.